Three years ago, we began what we thought would be a short sprint from Grassy Meadows, WV to Myrtle Beach, SC. 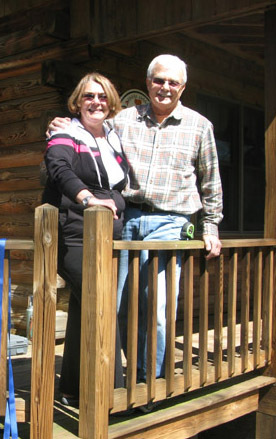 The sprint turned into a two and a half year journey as we awaited the sale of our log home an d traveled back and forth between the two places. During the “duration” we were supported by the expert help of Foxfire’s professionals, Richard and Paul Grist and staff. They were attentive to our requests and paid close attention to all aspects of the selling experience. We’d built our home and raised our family in Grassy Meadows over a 30 year span, and while we wanted to move closer to family, we found it to be a major upheaval and stressful time as months stretched to years and offers were made and didn’t pan out for one reason or another. While we lived comfortably in SC, we felt confident leaving our house in their care. Throughout, the Foxfire team kept us informed and worked steadily to bring several prospective buyers to our country location – through snow, rain and other inconveniences. We were very pleased when an offer was made and accepted last winter, but the experience wasn’t over! Both Richard and Paul continued to guide us and the buyers through all the necessary inspections, paperwork, meetings, negotiations and finally, the closing after a long two months. Looking back on the experience, we are certain no one could have done a better job for us, and we’re grateful that we asked them to take on the sale of our home and woods. They are true professionals in every way.